Monochrome photograph in a series of 19 of a Patrol Second (single white stripe on shirt pocket) at camp standing in front of a bell tent. 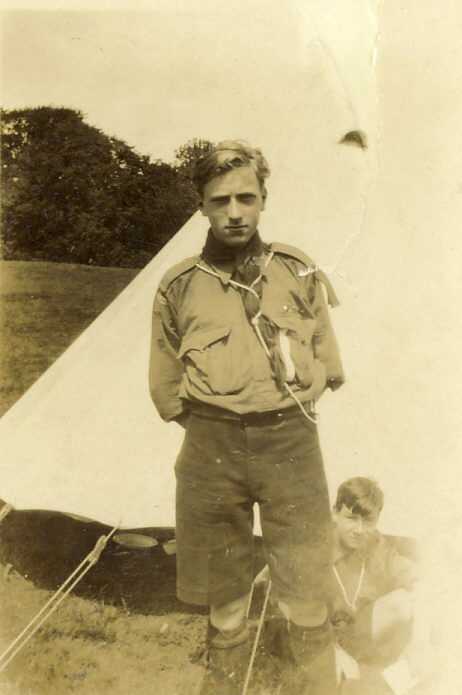 The previous image shows this scout in civilian clothes with annotation "RAF 1940"scout with the next previous image showing him as as a boy. One of a package of photographs contained in an old Kodak envelope marked "Troop Leader H Leslie. One set of last camp for Troop Log. Remainder to be distributed democratically!! Sorry that there aren't more. Cheerio Baloo".